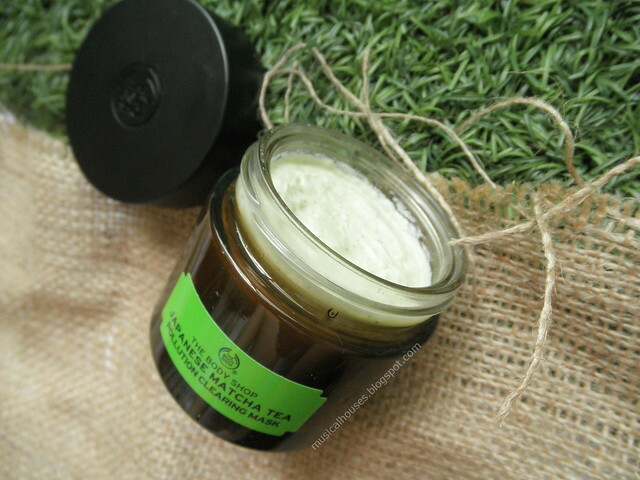 The Body Shop Japanese Matcha Tea Pollution Clearing Mask was launched a couple of months back, and I'm finally getting round to reviewing it! I really wanted to review this mask because it seems to tick off all the right, trendy boxes at the moment - the website for the Japanese Matcha Tea Mask claims that the mask is "100% vegan" (which I interpreted to mean that it doesn't contain any animal-derived ingredients), and that it "purifies, gently exfoliates and liberates your skin from the weekly build-up of city pollutants and everyday impurities". For those of us (including myself) who live in highly urbanized, city environments, doesn't this sound great? 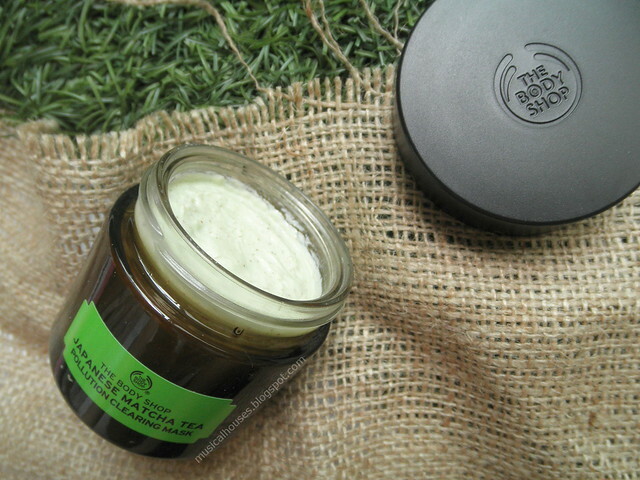 As is typical of The Body Shop products, the Japanese Matcha Tea Pollution Clearing Mask also boasts a few plant-derived ingredients, as you might expect from a "vegan" mask. There's "matcha green tea from Kakegawa, Japan, dandelion extract and soul-soothing Community Trade aloe vera from Mexico". Also, you can't tell from a first glance at the advertising material, but this mask actually has little scrubby bits - in this case, they are again derived from two plants, Luffa Cylindrica and Apricot Seed Powder. But the exfoliation offered by this mask is advertised as being gentle - this isn't one of those harsh masks. How is The Body Shop Japanese Matcha Tea Pollution Clearing Mask as a clay mask? As an exfoliating product? Would it work for sensitive skin? And which ingredients are in there making the product work? We'll find out! Aqua/Water/Eau, Kaolin, Propanediol, Olea Europaea Fruit Oil/Olea Europaea (Olive) Fruit Oil, Glycerin, Cetearyl Alcohol, Luffa Cylindrica Fruit, Butyrospermum Parkii Butter/Butyrospermum Parkii (Shea) Butter, Glyceryl Stearate, PEG-100 Stearate, Phenoxyethanol, Parfum/Fragrance, Caprylyl Glycol, Polysorbate 60, Sodium Polyacrylate, Prunus Armeniaca Seed Powder/Prunus Armeniaca (Apricot) Seed Powder, Acrylates/C10-30 Alkyl Acrylate Crosspolymer, Aloe Barbadensis Leaf Juice Powder, Tocopherol, Trisodium Ethylenediamine Disuccinate, Butyl Methoxydibenzoylmethane, Taraxacum Officinale Rhizome/Root Extract/Taraxacum Officinale (Dandelion) Rhizome/Root Extract, Menthol, Sodium Hydroxide, Tetrasodium Pyrophosphate, Limonene, Citric Acid, Camellia Sinensis Leaf Extract, Ethylhexylglycerin, Sodium Benzoate, Potassium Sorbate, Caramel, CI 19140/Yellow 5, CI 42090/Blue 1. From the ingredients above, we can see some ingredients that are typical of a mask - water and clay (Kaolin), After that, you get a solvent (Propanediol), followed by a variety of emollients (Olea Europaea Fruit Oil/Olea Europaea (Olive) Fruit Oil, Cetearyl Alcohol, Butyrospermum Parkii Butter/Butyrospermum Parkii (Shea) Butter) as well as emulsifiers (Glyceryl Stearate, PEG-100 Stearate). We also see the ingredient Luffa Cylindrica Fruit, which here is used as the scrubby bits for physical exfoliation. And yes, it is also indeed the same type of plant as you see in your loofas. After that, we hit the first preservative, Phenoxyethanol, as well as the fragrance ingredient, so we know that we've covered most of the key ingredients in this product. After the preservative and fragrance, we have more humectants (Caprylyl Glycol), thickeners (Polysorbate 60, Sodium Polyacrylate), polymers (Acrylates/C10-30 Alkyl Acrylate Crosspolymer) as well as more scrubby bits from apricot seed (Prunus Armeniaca Seed Powder/Prunus Armeniaca (Apricot) Seed Powder), and a variety of plant extracts and ingredients, which include the advertised matcha, aloe vera and dandelion (Aloe Barbadensis Leaf Juice Powder, Taraxacum Officinale Rhizome/Root Extract/Taraxacum Officinale (Dandelion) Rhizome/Root Extract, Camellia Sinensis Leaf Extract), and some Menthol to give that tingly feeling/smell. 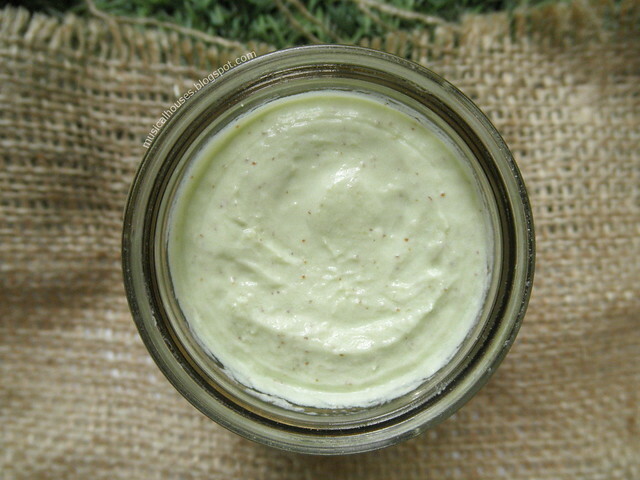 There are also other functional ingredients like preservatives, buffering agents and chelating agents (Citric Acid, Trisodium Ethylenediamine Disuccinate, Ethylhexylglycerin, Sodium Benzoate, Potassium Sorbate), pH adjusters (Sodium Hydroxide), and some dyes to give the product the nice green colour (Caramel, CI 19140/Yellow 5, CI 42090/Blue 1). Interestingly enough there's also Avobenzene (Butyl Methoxydibenzoylmethane), a sunscreen ingredient - I'm not too sure why because it's not like you'd need sunscreen in your mask. So, from the ingredients, we can see that this is a clay mask that is formulated to still be pretty moist, and mositurizing. 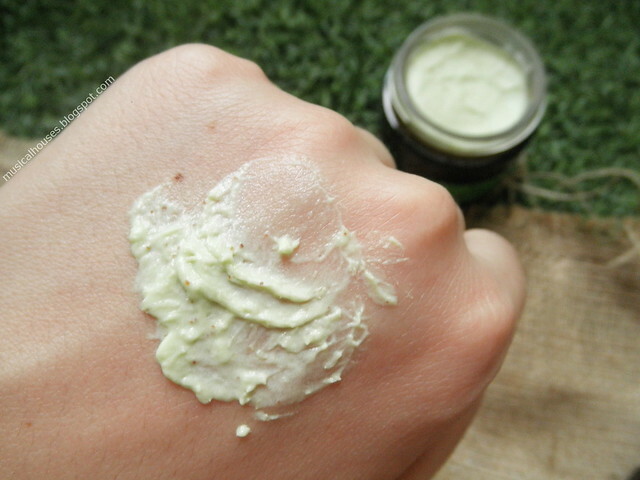 Clay masks can sometimes be a little drying, but the addition of the Olive Fruit Oil, Shea Butter, and other emollients mean that this mask isn't likely to be overly drying. On that note, I do appreciate that The Body Shop included both the Olive Fruit Oil and Shea Butter fairly high up in the ingredients list - it's a nice touch to really make sure the emollients are the plant-derived ingredients that are advertised. And while I'm not personally a huge fan of physical exfoliants, those who do like little scrubby bits in their masks will love that there are not one, but two kinds of scrubby bits - the luffa fruit, as well as apricot seed powder. The only really questionable things about the mask formula were the addition of Avobenzene, which I can't figure the reason for, and the fact that the green tea extract seems to be present only in very small amounts despite the product's name - in fact, the green tea extract is almost right at the end of the ingredients list, just before a few preservatives and dyes. For the former, I'm sure there must be a legit reason for including it inside which I just don't know yet (otherwise you'd assume that it would just be excluded). For the latter, the "naming a product after an ingredient that's not actually there in large amounts" marketing strategy is such a common gimmick used by so many brands in the beauty industry, that I'm honestly kinda blasé about it by now. Gimmick aside, it doesn't bother me as long as the underlying product is sufficiently well-formulated, which this fortunately is. That said, the other ingredients-based advertising claims are fairly accurate - this is indeed "formulated without silicones, mineral oil or paraffins" as The Body Shop claims, so those looking for a product along these lines would find this suitable (not that there is necessarily anything bad about those ingredients, but that's for another blogpost). So, after looking at the ingredients list, how does this fare on the skin? 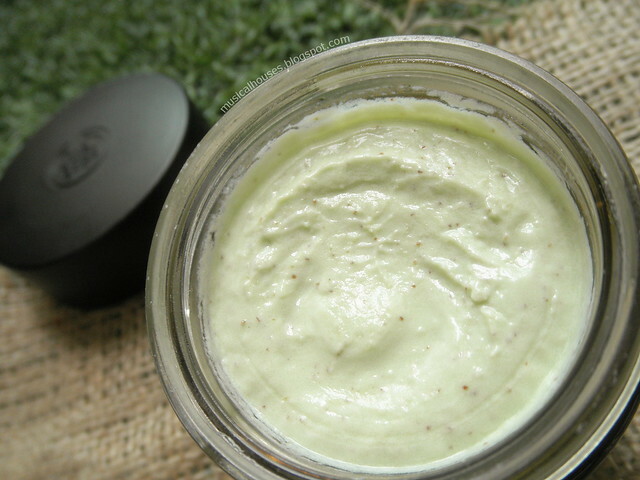 It does indeed have a nice, emollient and smooth texture for a clay mask, and rinsed off cleanly without leaving any oily residue behind on the skin. It also spreads easily on the skin, and feels fairly light, and not at all like the thick clay goop some clay masks might be. I'd say this mask has an almost mousse-y texture, for lack of a better description. The menthol in the product also adds a tingly feeling to the skin when applied, which some people might like. Usually I don't like tingly skincare products (unless there is a really strong acid in them), because sometimes the tingly sensation can be too much, but this was within my range of tolerance. You don't really notice the luffa and apricot seed powder bits until you are washing off the mask - that's when you get to scrub your skin, if you're a fan of doing so. The luffa and apricot seed powder were fairly gentle (in part thanks to the creamy mask base), so I didn't feel like this was overly-harsh. That said, personally for me, I try to be very, very, very gentle with the scrubbing so as not to aggravate any skin sensitivities, and of course, if you have any open wounds please don't use scrub your face with any scrubby bits! Overall I thought this was a good mask, despite the potential for overscrubbing. When rinsed off, it did leave my skin seeming softer and smoother, which was nice. So would I recommend this mask? Overall, yes. It's not hugely unique - it's a clay mask, after all - but as far as clay masks go, this is nicely executed. It's formulated to be emollient, with a good texture, and has the benefit of nice scrubby bits (if physical exfoliation is your cup of tea). So if you're looking for a clay mask that might work if your skin is on the drier side, or if you're looking for a nice mask with some physical exfoliants, this would probably be a good choice. If you are also looking for a mask that is, as claimed, free of silicones, mineral oil, and paraffin, and also has a variety of plant extracts, then the Japanese Matcha Tea Mask would also fit the bill. On the other hand, this might not be such a great mask to try if your skin is very sensitive to physical exfoliants, or has open wounds or scabs - in such cases, it might be better to wait until the wounds and scabs have fully healed before scrubbing your skin. At S$32.90, it's a fairly affordable, good quality mask, and worth checking out - just don't get too crazy with all the scrubbing! 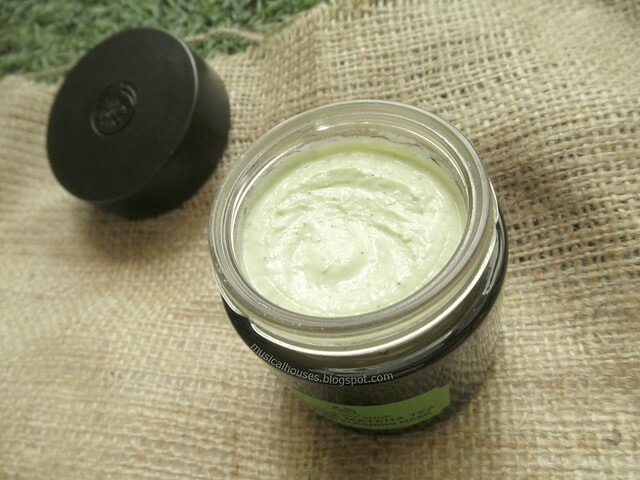 The Bottom Line: The Body Shop Japanese Matcha Tea Pollution Clearing Mask is a clay mask with emollients to make it more moisturizing, a light texture, and some physical exfoliation via the use of luffa and apricot seed powder, making it a nice choice for those looking for a non-drying clay mask. I was considering getting this product but was turned off when I saw how far down the ingredients list green tea extract was. I will stick to the Loreal purifying charcoal clay mask. I think it's really good. @Anonymous: Haha yes, unfortunately advertising a plant extract that isn't there in large amounts is one of the oldest tricks in beauty product marketing! Basically almost every brand does it at this point now, I'm so used to seeing it because it's so common. And yes, I would definitely consider doing a breakdown of the ingredients list for Fair and Lovely, although I understand the marketing of that product is slightly controversial! But I'm curious to see what the ingredients of a product called "Fair and Lovely" would be like too.